Orrville Red Rider Sports Blog: Nope, no pressure here. Since there's nothing else going on (I'm flattered that so many of you have clicked over here hoping to read my take on "the story", sorry to disappoint you.) let's talk about the post-season, specifically the expectations being put on this years team. The Ohio High School Hoops blog has been a fan of the Red Riders all season, consistently ranking us in the top 10 of his D3 poll, and the love continues in their post-season predictions. Sidebar: How about that picture? 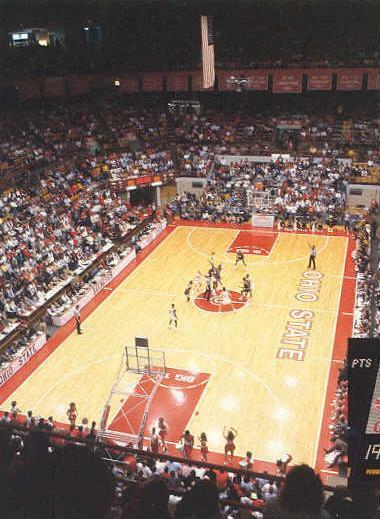 Good old St. John Arena. That's about the view that fans had for our state games. What a great barn that was. Read here for all the details....in short, the author picks the Riders as his Final 4 team coming out of Canton. I can't necessarily disagree with him, I think if they play like they're capable, Columbus is possible....but right now, Columbus is possible for each and every team entering tourney play....and given our recent history, I don't want to get too excited about that prospect. Here's my thoughts...some good, some bad, in no certain order. 1. We're due. Simple as that. I said it back 5 yeras ago when we hadn't beaten Wooster in football in 4 or 5 years...and it worked then. I think this year iswhen the law of averages works itself back out. Our last district title was in 1996 (our first and only title coming out of Canton). The 13 years since have been filled with tough draws, bad games and disappointing efforts.....and it's time that changed. 2. Let's get a sectional title first. Baby steps, people. Would you believe that 2005 was our last SECTIONAL title?? It's true. Here's the '05 bracket, that's as far as we've been in the last 5 seasons. For the complete record, here's 2006, 2007, 2008. We all remember the loss to Minerva last year (in the sectional semifinal). 3. Local teams know us. Not a good thing, and lately everyone has been playing us close. Triway, Northwestern and Smithville know our style, and all 3 have seen us this year, and Triway beat us. They will try to take the air out of the ball, double Wasson down low and shadow Jake wherever he goes. They will force someone not wearing #12 or #33 to beat us...and why not. Jake and Zach are 61% of our offensive output....and we're clearly a different team when either or both are on the bench. If I know this...then so do Keith Snoddy, Alberts (Jr.) and documentary film star Mike Snowbarger. We can't let teams dictate tempo...but on the flip side, we can't play so fast that we're out of control. 4. An effective supporting cast. Guys like Sam Miller, Joey Besancon and Daniel Groves need to make teams pay for paying too much attention to Jake and Zach. We need 20+ points per game to come from this group....but above all, they need to do the small things...rebound, take charges, press and make smart decisions with the ball. 5. Max Pirman. It's time to see Max play like he's capable. He needs to be that 2nd guy down low to take pressure off Wasson. Right now teams are packing it in and slacking off guys like Miller, Groves and Pirman because they know the 1st option is Wasson. If a guy like Max can steup and be an inside presence, it will open up more looks for Jake and Zach. The hair is cool, but I'd trade it for 10 points a game in the post-season. 6. Better Fan Support. The turnout at the Fieldhouse last year was simply pathetic, and obvious to everyone in attendance (and I'm sure with the players and coaches too)...it was a real lowpoint in terms of fan apathy. Hopefully with higher expectations come bigger crowds. The games being in Wooster will surely help that. Student section needs to be loud & proud too. 7. White Unis. Being the 1 seed and on top of the bracket, we'll be wearing white for every potential district game. We've only lost 1 game while wearing our white uni's (to Mansfield Sr.) so maybe that's a good thing....and maybe it has nothing to do with anything. 8. A District Final at the COW? Cart before the horse, but if we end up in a district final, and the game gets moved to Timken Gym...that has to benefit us, right? When's the last time we lost a game at the College? We've never lost a Smitty Classic game there. You'd have to go back to when we used to play Wooster once per year, and the game was held there. I'm sure there's more to talk about, but this is what's on my mind right now. I'm cautiously optimistic.